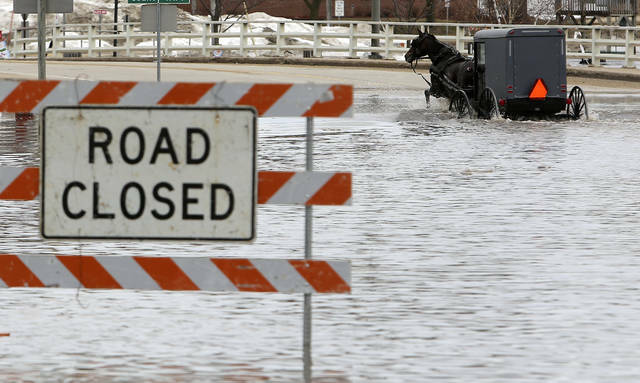 BISMARCK, N.D. (AP) — Heavy rain falling atop deeply frozen ground has prompted evacuations along swollen rivers in Wisconsin, Nebraska and other Midwestern states, while powerful wind and snow has impacted hundreds of miles of interstates in North Dakota. The flooding is likely to persist into the weekend in states where frozen ground is preventing snowmelt and rain from a massive late-winter storm from soaking into the soil, according to forecasters. Snow and poor visibility prompted officials to close two interstates in eastern North Dakota, though the roadways were slowly reopening late Friday morning. In South Dakota, schools in Rapid City were closed as residents dug out from a blizzard, while flooding on the other side of the state prompted officials in Sioux Falls to go door-to-door and evacuate residents from homes. 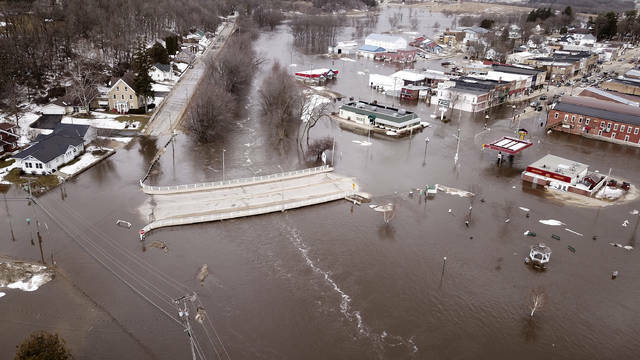 Flooding made several highways impassable in Wisconsin, where rescuers in Fond du Lac had to move residents to higher ground after flooding along the Fond du Lac River. And a tornado that swept through mid-Michigan late Thursday damaged at least 21 homes and knocked out power to thousands of people, according to state police and first-responders. No injuries were immediately reported. The system, which moved into the Midwest after crippling parts of Colorado and Wyoming with blizzard conditions, continues to move east — but the effects aren’t expected to be as bad as what was seen Thursday in Nebraska and Iowa, where quickly rising water washed out roads, triggered evacuations and left farmers worried that all the water would drown livestock. 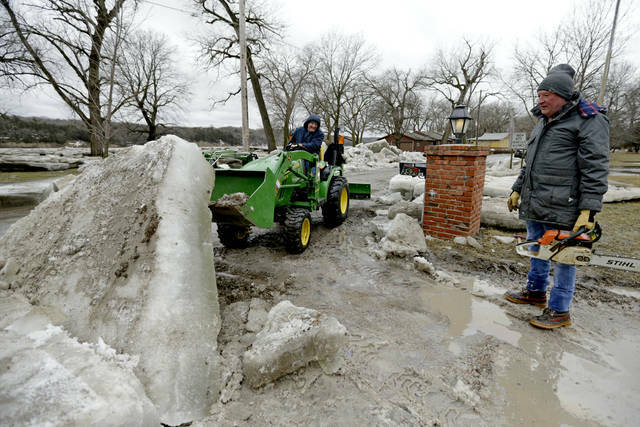 “With the frozen ground and amount of rain our area had, it was just a perfect set of circumstances that led to the flooding we’re seeing in Nebraska and Iowa,” meteorologist Paul Fajman said. Local residents who had to evacuate will be cleaning up the damage for some time. Many of the homes in Freeman’s neighborhood were inundated by water that flowed in from the Platte River. Fajman said parts of northeastern Iowa also can expect more flooding Friday and into the weekend. South Dakota Gov. Kristi Noem closed all state offices Thursday as the blizzard conditions moved in, and later in the day ordered the opening of the state’s Emergency Operations Center to handle the response to the blizzard and flooding. Rainfall records were set Wednesday in Sioux Falls, South Dakota, and Sioux City, Iowa. “We’ve got a lot of water, and it’s got to find a way to get out of here,” said Tracy West, mayor of Lennox, South Dakota. Contributing to this report were Associated Press reporters Josh Funk in Omaha, Nebraska; Dan Elliott in Longmont, Colorado; David Pitt in Des Moines, Iowa; Bob Moen and Mead Gruver in Cheyenne, Wyoming; Gretchen Ehlke in Milwaukee; Nelson Lampe in Omaha, Nebraska. KANSAS CITY, Mo. (AP) — Passenger rail traffic along a popular Missouri route has been suspended and evacuations continue amid flooding along the Missouri River. Recently, I was driving home up highway 169 in Lee County, Alabama. Ten minutes after we passed a roadside business, it was destroyed by 170 mile-per-hour winds. Trees turned into missiles, and 23 lives were lost. This monster storm tracked through Beauregard and Smith’s Station, destroying nearly every home along a 24-mile path. Victims included three small children, 10 members of one African-American family, and Maggie Robinson, a nurse at the East Alabama Medical Center for 40 years. As the climate changes, deadly storms like the one that killed Maggie are more frequent. Rural areas suffer the most. When a storm hits a community like Beauregard, where many people live in mobile homes and at or below the poverty line, dozens can die in seconds. I’ve helped rural communities recover from natural disasters for two decades, and spent two years on the Gulf Coast helping rebuild from Hurricane Katrina. Once news cameras leave, rural people are left on their own. Drug abuse goes up, and so does domestic violence. We lost many people to suicide after Katrina. In Florida and Georgia, where Hurricane Michael did even more inland damage, people are still living in tents. Natural disasters don’t discriminate: they kill everyone. But disaster recovery, sadly, does discriminate: poor and rural communities quickly get forgotten. Big relief groups come in and take donations after disasters, leaving grassroots groups to do the hard work of recovery after they’re gone. In Hackleburg, Alabama, where an EF-5 tornado destroyed most of the town in 2011, a local youth ranch stepped up to the task. I helped them network with volunteers at a community center in the mountains of Northeast Alabama, all the way across the state, to meet the needs of poor and elderly people who had lost everything. Both areas had been hit with monster storms. But their combined resources made the recovery easier. This is a huge gap in rural disaster recovery: local groups do the hard work, but often don’t have what they need to help people recover. That’s why I’ve set up the Rural Disaster Recovery Network, to help local nonprofits like Hometown Action connect with skilled volunteers and resources in places like Lee County. That’s what we did in Tuscaloosa in 2011 after tornadoes killed 41 people. Twenty small nonprofits in small towns throughout Alabama came together, shared resources, and we supported each other. I’ve seen the best of humanity come out in rural communities after disasters. Class and race, all of that goes out the window. Everybody comes together, because we’re all human beings — and that’s all that matters in the aftermath of a storm. If we could find a way to bottle that spirit, it would solve all of our problems. There’s an opportunity in disaster relief to go into rural communities and to learn about them, learn from them, and understand them. That is one of the hardest things we have to do — we’re so divided right now as a country. And yes, the South definitely deserves some of the flak we get for this. But disasters don’t discriminate, and we shouldn’t either. That’s the best of the rural spirit. I’ve witnessed overt racism and bigotry in Alabama, but I’ve also seen Blacks and whites cry together, holding each other, after big storms. There’s a lot more nuance to the South, and a growing movement of people who want change. In disaster recovery, there’s an opportunity to bring people together, sow seeds of kindness, and start enacting real change here. Warren Alan Tidwell has worked on disaster relief efforts in the South for 20 years. He’s a member of Hometown Action, part of the People’s Action network. Distributed by OtherWords.org.